Truth Provided Newsletter -Breaking the "Sunday Sabbath" Caused the Tsunami? Christian greetings in these last days of life on earth. In this Newsletter I hope to share with you glimpse into the future. In fact it is a look into the very NEAR future for Sabbath keepers all around the world. One thing that is plain regarding the Remnant of God is there uncanny ability to decipher prophecy. This is the main reason the dragon is angry at the Remnant of her seed. (Rev 12:17) We can tell you today what the enemy of all souls will do tomorrow not because we are prophets, but because we understand how to use the Bible to decipher prophetic symbols. Once you learn this God given lesson, it’s truly very easy to know what will happen next. When you study the prophecies of the Bible, especially the final ones, you come to realize a pattern in how the devil will seek to manipulate the Word in an attempt to thwart that which we have been called to proclaim as present truth. Many people of all walks of life look upon us as Sabbath peddlers or Sunday bashers without realizing it is because of their choice of sin we seek to warn them. If the majority of the churches were preaching we must keep nine of the ten commandments from their pulpits while proclaiming number seven to be invalid, we would no doubt be tagged “abstinence peddlers” no doubt. However, in reality we see that the churches of the world seek to ignore commandment number four as being invalid. Hence, the reason we are called Sabbath peddlers. So be it. The enemy we find ourselves engaging daily is a cunning and hateful being literally hell-bent on our destruction. As we all know, he has been able to twist the written Word to his end just as cleverly as he did in the Garden of Eden. Christians the World over see Sunday as the Lord’s day, and they do so without the slightest bit of Biblical evidence to back it up. That fact alone amazes me, especially when they claim to be Bible believers. In fact, you can offer these Christians tens of thousands of dollars, and even millions to come up with a single verse proving the Lord changed the Sabbath from day seven to day one, and they all fail miserably in finding the verse, and obtaining the cash. YET they persist in keeping what they already know is NOT of God as a holy day. They as well as their leaders know for a fact the Lord never changed it. Still they keep Sunday holy irregardless of the clear thus saith the Lord condemning it. The Latter Rain is already falling, and soon it will begin falling more abundantly on some of us that are called to preach this truth more boldly. In fact, some of us have already started. Both signs of major resistance as well as acceptance are already being realized, and many attacks on the Sabbath itself have been seen in both the secular and religious world today. Take for example the hundreds of articles I have on my “Sabbath attack” page that show the media has become involved in pushing forth the mark of the Roman beast. Before sharing the shocking article that is the basis of this Newsletter, let me give a fairly quick rundown on what we as Christians understand as the next chain of events. The Latter Rain falls abundantly. The Repairers of the breach that Isaiah 58 speaks of (the Remnant) go forth with a much clearer easy to understand message regarding the Law of God and His eternal Sabbath. So clear in fact that not only Sunday keepers begin to embrace it, but non-believers accept it as truth as well. In fact, this has already started to occur in many areas today. Of course, this causes great concern for the Sunday keeping religious leaders. Their pews are emptying more rapidly then ever before, and their pocket books are greatly affected. Seeing how they are in fact preachers of filthy lucre, the god they worship is being pulled out of their pockets, and that angers them. Absolute truth has a great effect on some of their congregation. It actually gives them a bold confidence to speak of it. So even more come out of Babylon then ever before when they share with loved ones. Then the natural disasters start to pick up a bit more and the powers that be are seeking answers from the churches and religious leaders on how to stop the problems. The Protestant churches will at that time extend their hands towards Rome for assistance in this matter as prophecy already predicted they would. (See Rev. 13:11,12) Of course Rome will suggest to their Protestant friends that the Sabbath keeping Christians Revelation 14:12 describes will be the reason for the disasters. The church then lobbies (speak –Rev 13:15) new laws, and the Roman Catholic controlled government passes (and cause –Rev 13:15) those laws so as to make it more difficult for the preaching of present truth to continue. Seeing how this is a “suggestion” by Rome, the Protestant churches will have to be the ones that actually push for the laws as we see Pat Robertson already doing regarding the removal of the separation of church & State. They convince the governing authorities that the disasters will be stopped if we as a nation adhere to God’s “Sunday” Sabbath. Still, the preaching of Present Truth gets out, and many more are converted regardless of their efforts. All along the disasters grow in number as well as in size bringing James 5:3 into reality due to massive financial drains on the economy. As is always the case, when the governing officials pocket book is hit, the intensity of wicked responses will increase dramatically. Since the Protestants have already convinced them the disasters are the Sabbath keepers fault, eventually the final statement from the Government will boldly be made public that the problems we all face as a human race are due to the Sabbath keepers that won’t keep Sunday holy. A statement like this cannot be made UNTIL the "image of the beast" is actually realized. A secular government cannot make a religious law. So, a "United States Church of America" needs to make the statement. Laws will then be strictly enforced to keep Sunday holy as the Pope has already suggested back in 1998 in his “Dios Domini”, and the people begin to clamor to the error as if it is absolute truth (2 Thess. 2:11) and as a way to save their lives. (Mat. 16:25) The people have been conditioned to be far more concerned with their flesh, their livelihood, and creature comforts rather then their eternal souls. They don’t even bother verifying the new laws as Biblical. A “quick fix” is more convenient and plausible now, as the people have been readied for it. Then we as true Remnant Christians will be the target of big government and all the so called Christians of the land because we refuse to comply. Laws will be put in place to prevent buying and selling (Rev 13:17) for those of us that refuse to adhere to the Roman mandate in the hopes of forcing us to agree with the law. Many of our brethren will bow under that pressure, especially those in prisons and hospitals for obvious reasons. Still, a small faction of the Sabbath keepers will remain active and must be stopped as the disasters continue to intensify. So, a death sentence will ensue, as the strange comments made so long ago will be echoed one again. It will be proclaimed that it is better for this small number of Sabbath keepers to die then for the whole nation to perish. (See John 11:50) Then, those of us that are still alive will be blessed with a full view of the wrath of God upon mankind. For now the cup has been filled to overflowing and a day of reckoning has come. Too far fetched you say? It would be a ridiculous thought to even think that church leaders would suggest that God is so angry with the people because they are breaking His so called “Sunday Sabbath” that He sends disasters to kill them? If this is what you thing, then read this..
A Christian minister claims the tsunami of Sunday, Dec. 26, killing at least 160,000 people, was direct result of "pleasure seekers" breaking God's Sabbath. In the February issue of his church magazine, Rev. John MacLeod of the Free Presbyterian Church of Scotland writes: "Possibly ... no event since Noah's flood has caused such loss of life by drowning as the recent Asian tsunami. That so many of our fellow creatures should have perished in so short a time, and in so awful a fashion, was a divine visitation that ought to make men tremble the world over." He continued: "Some of the places most affected by the tsunami attracted pleasure-seekers from all over the world. It has to be noted that the wave arrived on the Lord's day, the day God set apart to be observed the world over as a holy resting from all employments and recreations that are lawful on other days." The tsunami, a series of tidal waves sparked by a subsea earthquake off Sumatra, arrived on Sunday morning, the day after Christmas, in countries including Indonesia, Sri Lanka, India and Thailand. MacLeod said: "To rule out the hand of God in this ... is to forget that He is in sovereign control of all events. If the sparrow falling to the ground is an event noted, and ordered, by Him, how much is this the case when the souls of so many thousands are parted from their bodies?" The 74-year-old minister, now living in the London area after spending 35 years in Stornoway, Scotland, concluded: "Do not worldliness, materialism, hedonism, uncleanness, and pleasure-seeking characterize our own generation to a great extent and does not this solemn visitation in providence reminds us that He remains the same God still? God is no idle spectator of what is happening here in time and treats men with the sharpness and severity in order that they may know their vices." …There have been news accounts about Muslims who believe the tsunami was divine retribution for sinning, but they have cited prostitution and heavy drinking instead of Sabbath observance. 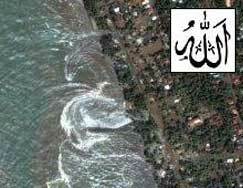 Some have even gone so far as to claim God signed his name as Allah in the waves off the Sri Lankan town of Kalutara, as captured by satellite photography. "This clearly spells out the name 'Allah' in Arabic," Mohamed Faizeen, manager of the Centre for Islamic Studies in Colombo, told Agence France-Presse. "He sent it as punishment. This comes from ignoring His laws." "Allah first sends small punishments – like loss of business. If we ignore the warning, He sends bigger ones – loss of life. If we still ignore the warnings, the big punishments, like earthquakes and tsunamis will come." The Presbyterian Church USA hosted a three-day meeting to justify to denomination leaders its decision to divest from Israel, presenting what one church elder described as a panel of "full-time, paid, anti-Israel propagandists." The event, which occurred Feb. 10-12 at the denomination's headquarters in Louisville, Ky., was entitled "Steps Toward Peace in Israel and Palestine." In July, the denomination's General Assembly voted 431-62 to divest from the Jewish state. The PCUSA is believed to be the largest organization or institution to join the divestment campaign against the Jewish state. It was the first Christian denomination to do so. Again, I know the Jewish people are not Christians. But I believe the subliminal approach is obvious here. Look at it this way.. A Protestant denomination goes on record as saying we need to stop breaking the Roman Sunday Sabbath. Then just two days later we see the very same Protestant denomination boldly speaking out against a known Sabbath keeping group of people. One day they are saying breaking the Sunday Sabbath is causing people to die, and two days later they proclaim their desire to place Jewish Sabbath keepers in an unfavorable light. 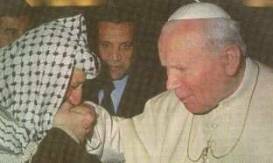 Soon this anti-Semitic hatred will be cultivated to include ALL Sabbath keepers as prophecy says is inevitable. (Rev 13:15) By their own admission they believe it is because of Sunday Sabbath breaking, these disasters are happening. So it will eventually become common place to blame the Jews and any and all Sabbath keeping Christians for the natural disasters around the world. If you don’t embrace Sunday as being the Sabbath, then YOU are the problem! So it won’t matter if you are a Jew or a Sabbath keeping Christian at this point. Clergy who deny the existence of God and other key doctrines could soon face heresy trials in the Church of England. Proposals to set up tribunals to try doctrinal cases were rejected by the Synod last year but the House of Laity overwhelmingly voted yesterday to reintroduce them. Members of the House, who were meeting before the full Synod began, criticised liberal clergy for diluting traditional teaching, though one said that they did not propose burning heretics at the stake. The House of Bishops has independently agreed to reintroduce the proposals, which were defeated by a narrow margin last July after clergy expressed fears that they would be victims of a witchhunt. …"Let us make sure the liberals really do preach the word of God." …Quoting from a survey carried out in 2002 of what the Church of England believed in, he said just 76 per cent of clergy believed Jesus Christ died to take away the sins of the world, 68 per cent believed Jesus rose physically from the dead and 53 per cent believed faith in Jesus was the only way they could be saved. Among women clergy, the figures came in at about 10 per cent lower in each category. "These figures are nothing less than astonishing and underlie the need for this measure," said Mr LeRoy. He blamed Britain's "post-Enlightenment, pluralist, relativist Western culture to which we have succumbed". …She said that she was not suggesting that modern heretics should be "burned at the stake". But she added that such people should not be allowed to draw a stipend or receive official sanction to lead their flock astray. …The proposals are set to be voted on at next year's Synod. If members approve the measure, it will then go before Parliament, where it will require primary legislation. Assuming it passes at Westminster, heresy trials could begin within five years. Does this not sound like ROME? And did you notice they seem to bring up the “burning at the stake” issue as something they do not condone? Yet they bring it up more then once? They do so because it is something that needs to be mentioned as a possibility in the future. The people need to be conditioned on hearing it. It will be used as a scare tactic, and in some cases as a reality. In fact, Muslims have already been known to burn people alive in the Middle East for years now. Do you recall the "ring of fire" they televised so often in the 80's? (A car tire is placed over the head of a bound victim. Gasoline is poured into the tire well. It is ignited burning only the head and shoulders of the victim.) Again... Far fetched you say? Would you have said it was far fetched for the USA to be torturing people if someone suggested such a thing 3 or 4 years ago? Or would it be far fetched if someone told you a few months ago the USA would fund experiments on how to torture Christians to see how best to combat God's ability to help His followers? Truth is, BOTH of these scenarios are happening RIGHT NOW! We already know about the USA torturing Iraqi’s in military concentration camps, but were you aware of this…? PEOPLE are to be tortured in laboratories at Oxford University in a US-funded experiment to determine if belief in God is effective in relieving pain. Top neurologists, pharmacologists, anatomists, ethicists and theologians are to examine the scientific basis of religious belief and whether it is anything more than a placebo. Oxford's new Centre for the Science of the Mind is to use imaging systems to find out how religious, spiritual and other belief systems, such as an illogical belief in the innate superiority of men, influence consciousness. Researchers believe the study will provide insights into the war on terrorism. A central aspect of the two-year study, which has $US2 million ($2.65 million) funding from the US philanthropic group the John Templeton Foundation, will involve dozens of people being subjected to painful experiments in laboratory conditions. While enduring the agony, they will be exposed to religious symbols such as images of the Virgin Mary or a crucifix. Their neurological responses will be measured to determine the efficacy of their faith in helping them to cope. The aim is to develop new and practical approaches "for promoting wellbeing and ultimately maximising individual human potential". The pain experiments will be conducted under the direction of researcher Toby Collins, who has a background in marine biology and the nerve systems of invertebrates. He said many people in pain turned to faith for relief. Dr Collins said the experiments would involve non-invasive simulation of burns and would be conducted according to strict ethical rules. As they suffer, the human guinea pigs will be asked to access a belief system, whether religious or otherwise. In the article it stated that, “While enduring the agony, they will be exposed to religious symbols such as images of the Virgin Mary or a crucifix” Those are Roman CATHOLIC images of worship are they not? It was also stated in the article that, “A better understanding of the physiology of belief, the conditions that entrench it in the mind and its usefulness in mitigating pain could be crucial to developing counter-terrorist strategies for the future” Did you catch that? It’s easy to miss, so I will try to explain. One minute they are speaking of using torture on Christian people so as to see if they will have any problems torturing them in the future. They want to see if their God help them of course. Then the next minute they admit it will be used on what they define as TERRORISTS! They are openly stating in this article that they will be using torture on what they have now just defined in that article as CHRISTIAN TERRORISTS! One other thing I did appreciate here is the sheer stupidity of the powers that be. Besides the fact that we as Remnant Christians know "...Thou shalt not tempt the Lord thy God." We also know a crucifix and a statue of Mary are in no way something we consider godly in any way shape or form. So I ask, do they actually think the Almighty is going to play along with their ridiculous plans? Think about that simple fact for a moment. Do they THINK God is a puppet? Do they think they can sneak a Christian volunteer into their lab torture chamber, inflict torture on them, and then have them ask their God for strength so they can find a better way to bypass God’s protection in future cases? As if God didn’t see them walking into the lab in the first place to test Him? A TRUE Christian would never put the Lord thy God to a foolish test, and most assuredly they would never help teach an evil government on how to get around God. As if that was possible to do anyway! The people they are bringing in those labs are NOT Christians! Christians simply don’t do that! They are CATHOLICS they’re bringing into that lab! The fact they are using Catholic images proves this perfectly. Only a Catholic would be moved by those false idols. The reality here is they have actually solicited the help of Roman Catholics to try and figure out how to attack God’s people. Strange as it may seem, that appears to be the case here. And another strange thing is, they are doing this IN ENGLAND! This is the same country that said in the previous article that they seek to have trials for people committing heresy. Will they use torture as a sentence for those convicted? Or will they use torture to get them to admit heresy as Rome did in the past? Now do you understand why I pointed out the fact they said kept mentioning “burning people at the stake” as if it was a bad thing? Yet, as they spoke, how many people were being tortured on their own soil in the US funded experiments in Oxford University? The University has admitted to using BURNING SENSATIONS as a way to test torture! If they weren’t planning on using fire on Christians, why test "BURNING" sensations? So again, the repeated mentioning of “burning at the stake” was no mistake. By the way, do you believe it to be a far fetched statement to say some people would seek to burn Christians at the stake in TODAY’S modern society? Were you aware there is an online conversation between a Roman Catholic priest and some other people regarding the “BENEFITS OF BURNING PEOPLE AT THE STAKE” today? It first appeared on the EWTN (Roman Catholic mainstream website for “Eternal Word Television Network”) back in May of 2002. I have a copy of it on my “Evils of EWTN” page on the site. It’s seems nothing is too far fetched for Rome even for today. Is it not prophesied the wound will be TOTALLY healed and Rome will start it’s hellish killings again? Yes it is! With all that has been said, is the agenda for a Sunday law being pushed forward since John Paul II demanded civil laws for same back in 1998? …under the new European policy, Italy will again be required to fix a certain "day of rest." In an interview with the daily Corriere della Sera, Bishop Giancarlo Bregantini-- who heads a committee dealing with social issues for the Italian bishops' conference-- remarked that attitudes on the observance of the Sabbath are "already bad enough" without a change in national policy. He said that any move away from the Sunday rest would be "a perverse act." And Cardinal Pio Laghi, the former prefect of the Congregation for Catholic Education, asked La Repubblica: "How can you overlook the fact that Sunday is a special day for millions of Europeans?" If you have been watching the ONE WORLD GOVERNMENT agenda the last few years, you would have realized that they are testing ALL the laws of Antichrist on the people residing in the European continent. The one world currency, the Euro dollar was invented, tested, and approved there. The global passport has been invented, tested and approved there. The one world court has been invented, tested and approved there as well. Even the Roman Catholic church has been tested as a global church there, and most assuredly approved. And now we see debates on the Roman Sabbath being written into the fabric of the law so as to bring about testing upon the people in this prophetic area as well. And like all the other demonic inventions, this one will definitely be approved and written into Law. Back in 1962 under the instruction of America’s first Roman Catholic president, John F Kennedy, we saw the blue laws, or “Sunday Laws” come to life in the USA. The lamb horned beast is doing just as the Lord said he would. Yes, the laws are not “enforced” as of yet, unless of course you live in Rhode Island as of Jan 1, 1999, or Virginia as of July 2004. (Click here to see more info on these laws in the USA as well as other countries) And now we see that Italy, the true home of Antichrist’s Vatican, is embracing Sunday as their suggested “day of rest” as well. Some of these events make it all too clear that the Papists are attempting to shmooze the world to their own agenda once again. They have the European Union literally eating out of their hand. This is most definitely the graphic emergence of the New World Order and the government of the antichrist. Rome ruled this continent before the fall, and now the Roman Church will rule it and all the world soon. Now what I am about to share with you must be understood as SERIOUS! This is NOT a hoax! This is something that those of us that understand prophecy are very aware is factual. They won’t be able to enforce the mark of the Roman beast without tactics such as this. The document I am about to share is code named “Operation Garden Plot.” I shared info on this in an audio clip I did back in September of 2003. The official title of this document is, “The United States Civil Disturbance Plan 55-2.” I did not compile the below information, however I do have a few links under the article to allow for further research if you so desire. …provides for America's military and the National Guard State Partnership Program to join with United Nations personal in said operations. This links selected U.S. National Guard units with the Defense Ministries of "Partnership For Peace." This was done in an effort to provide military support to civil authorities in response to civil emergencies. Paragraph (1) Spontaneous civil disturbances which involve large numbers of persons and/or which continue for a considerable period of time, may exceed the capacity of local civil law enforcement agencies to suppress. Although this type of activity can arise without warning as a result of sudden, unanticipated popular unrest (past riots), it may also result from more prolonged dissidence. Paragraph (2) Planned acts of violence or civil disobedience which, through arising from the same causes as (1) above, are seized upon by a dedicated group of dissidents who plan and incite purposeful acts designed to disrupt social order. GENERAL Opposition forces or groups may attempt to gain knowledge of this plan and 'use that knowledge to prevent or degrade the effectiveness of the actions outlined in this plan. In order to protect operations undertaken to accomplish the mission, it is necessary to control sources of information that can be exploited by those opposition forces or groups. The signs are ALL around you now. The beast is known and clearly identified for it is the final days and the “man of sin” has been revealed to the Remnant of God. (See 2 Thess 2:3) The plans of this Roman beast are also well documented in the prophetic word, and now easily verified in your local newspapers! It is time to get ready! If you wait until the short time of trouble to get ready, you WILL NEVER be ready! Do you reflect the image of Christ yet? Are you a recipient of the now falling Latter Rain? If not, I suggest prayer and fasting! Ask the Lord to reveal the sin in your life. Ask him to forgive you! Then ask Him to bless you with divine wisdom, and the words that cut hearts so that MANY will come to the saving knowledge of the Lord Jesus Christ, and understand the whole duty of man as Ecclesiastes 12:13 so perfectly portrays. The Roman Catholic Church has complete and utter control of the US Government just as prophecy stated it would. The majority of Congress, the Senate, and the Supreme court is in her camp now! 174 of the 192 nations on earth are in agreement with her. The world truly does “wonder after the beast!” (See Rev. 13:3) All that prophecy said about this lamb horned beast (USA) is about to be played out before the eyes of mankind. And everyone will soon understand Antichrist is running this entire operation from the halls of ROME! 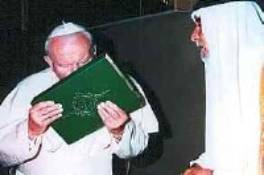 On March 12, 2000 Pope John Paul II admitted the popes of the past killed over 500 million Christians so as to bring to life their global governance desires. Prophecy did say this beast would be mortally wounded exactly 1260 years after it became a church & state. Roman Catholicism realized that conglomeration in 538ad when Vigilus ascended the papal chair under the military protection of Bellsariius! And exactly 1260 years later, in the exact year 1798 we saw Napoleon send in General Berthier to remove the Pope from civil power, stripping the Vatican of it’s state and church status! However, prophecy also declared this beast would be healed and stand again, and since the Lateran treaty was signed in 1929, bringing the church & state power back to the Roman Catholic church, we see this Antichristian organization growing stronger and stronger right before our eyes. It’s only a matter of time before the Roman Catholic beast starts to roar again. And that day is not too far off. Fact is, Pope John Paul re-instated the office of Inquisition in Feb of 1991. Common sense tell us the only reason to re-open an office that saw so many tortured and killed is because they plan on using its methods once again! And what is this good behaviour Rome is so proud of? "For professing faith contrary to the teachings of the Church of Rome, history records the martyrdom of more then one hundred million people. (That number has increased with research) A million Waldenses and Albigenses [Swiss and French Protestants] perished during a crusade proclaimed by Pope Innocent III in 1208. Beginning from the establishment of the Jesuits in 1540 to 1580, nine hundred thousand were destroyed. One hundred and fifty thousand perished by the Inquisition in thirty years. Within the space of thirty-eight years after the edict of Charles V against the Protestants, fifty thousand persons were hanged, beheaded, or burned alive for heresy. Eighteen thousand more perished during the administration of the Duke of Alva in five and a half years." --Brief Bible Readings, p. 16. Are you TRULY ready to stand before the hoards of Rome and declare the Law of God supreme over the laws of Rome? Are you ready to be killed for that declaration? Will you stand firm in the faith? If you’re not sure, it’s time to pray and fast NOW while it is still fairly easy to do so. Or will you side with Rome so as to spare your life? Mark 8:35, "For whosoever will save his life shall lose it; but whosoever shall lose his life for my sake and the gospel's, the same shall save it." One more thing. Do you recall the first article I shared in this Newsletter where the priest declared the Tsunami that killed 160,000 was the end result of Sunday Sabbath breaking? Could a prophetic statement from a woman that many Catholics claim to be a false prophet be this accurate? This prophetic warning alone should make MANY to understand Ellen G. White is in fact a true Prophet of the Lord sent in time for the last days. The fact Rome attacks her writings is proof enough for some. The mark of the Roman beast is inevitable! Are you ready? The 300 or so people watching the bank of seismic monitors are giving the weekend off for Christmas. Yet, never in the history of this agency have we seen this happen. The water was reported "hot" when arrived in the area. Nature has another quake (8.9) that is nearly as large as the Christmas quake (9.0) in the same area, yet no Tsunami. Why were the people given the day off? Think about it. Had they been manning their stations they would have seen the atomic blast. An earthquake rumbles in gradually to a peak, and then rumbles out. However, an atomic blast spikes to the top of the chart instantly and dissipates just as fast. Had the 300 or so employees witnessed this, it would have been impossible to prevent all of them from "being quite" about it. After hearing me make such a statement on WTPR, some have opted to shout I was changing prophetic facts. Yes, there will be many earthquakes in diverse places, and I actually share this to confirm the prophecy using historic fact in my book, "People Get Ready." (click menu item #15) This Tsunami quake is ONE QUAKE however, and the events surrounding it sparked my interest. I never said ALL the quakes were man made. Only this one. With that said, click here to see an article that appears to agree with me on this. I love your site, and it was instrumental in getting me out of the catholic church about three years ago. My husband is writing a book, and would like to use some of your information in it. Specifically, he is interested in some of the pictures of the pope. He would be glad to tell you more about what he is writing. I would also like to suggest that the type in the column in the left side of the site is very difficult to read: the print is awfully small for us middle agers, and is too faint. A slightly larger, darker print would be better for some of us! Thanks for a great, informative site. To enlarge the type on ANY website, just hold down the "CTRL" key and roll the "wheel" on the mouse up or down. Or, just click the "view" menu selection on your browser, scroll down to "text size" and pick your preference. I'm sorry you received such attacks. People should have moral boundaries in their criticisms. I'm not yet certain if I agree with many things on your website or not, but I certainly would never attack you like that. I don't think there is ever an excuse on the part of someone claiming to represent Christ to show such a lack of charity--I never saw anything like that on your site coming from you. Anyways, I wanted to write because I found it both sad and amusing at the same time that the same person that said that they are "simply more tolerant than you" is also the person that told you to **** off just a couple sentences later--that's like saying "i'm not abusive" 2 seconds before smacking someone in the face. I've said for a long time the, despite many arguments to the contrary, people that preach faith tend to be far more tolerant than people who preach tolerance--this person proved it. Anyways, thanks again for everything. Just wanted to express my gratitude towards GOD, for people like you and your family. I am also thankful for our small yet powerful community. I havn't had a church for a long; long; long; time. but this ministry here fulfills the need for fellowship and teachings. It's hard to find a good church these days, and (of course !) it's gonna become more and more challenging. This is something that I consider a precious gift; and I cannot take it for granted. Well Nick; I know you're very busy so, Ill keep this letter short. I just thought I'd write some "good-mail" to counter-balance the "hate-mail"
I AM LISTENING TO YOUR PROGRAM RIGHT NOW REGARDING THE CHURCH AND ABORTIONS, AND IT FLOORS ME THAT THEY SPEAK WITH FORKED TONGUE. HOW CAN A CHURCH OR RELIGION THAT TEACHES ITS PEOPLE IT IS WRONG TO ABORTED BABIES, AND HERE THEY ARE FOR MONEY AND GREED, SELLING AND ALLOWING ABORTIONS TO GET THE CELLS..THIS IS SO DISGUSTING. THANK GOD I LEFT THE CATHOLIC CHURCH. THERE WAS SO MUCH CORRUPTION FROM THE VERY BEGINNING IN THE CATHOLIC CHURCH, I CAN ONLY THINK THAT IT IS BY THE POWER OF SATAN THAT THIS CHURCH STILL EXISTS. ONLY BLINDED PEOPLE CAN GO ALONG WITH SOMETHING LIKE THIS. GOD PROTECT HIS REMNANT CHURCH. I recently heard your last broadcast. I couldn't help but to notice that you mentioned maItreya. there are a lot of us who believe that he Is NOT the antIchrIst, but he does fit the descrIptIon of the FALSE PROPHET. sInce the false prophet Is suppose to call fire and whatnot from heaven, but only In the presence of antIchrIst. you think this Is possible? I've received your newsletter for two or three months now, and my husband and I enjoy It. We are not Seventh Day Adventists. We are simply members of the bIblIcal Church of God, and we worship together on the Sabbath with our 14-month-old son In our home. We are looking for others to fellowship with, besides our friends we've met on the Internet. We came out of Babylon mainstream His (Southern Baptists) about five months ago. I started really studying the bible and learned we'd been deceived about nearly everything. We now keep the Sabbath and God's holy days, Instead of mainstream His's pagan holy days (Christmas, Easter, etc.). We keep the dietary laws and so on and so forth. We have grown much closer to God and Jesus Christ. We believe Sunday Is the mark of the beast, and we want to thank you for keeping us up to date. We don't agree with every SDA doctrine, but we realize It's much closer on target than mainstream His Is.